Will any man speak up? I keep wondering as I watch the eight o’clock prime-time TV play on either the national hook-up or a private channel. Look at this ‘hero’! He has three girlfriends but is shouting self-righteously, getting more and more purple in the face, threatening us – the viewers – that he is about to have a stroke when he finds out his sister has a boyfriend. Here’s another young man who is in love with a young woman who is NOT in love with him. Lo and behold! He kidnaps her and forces her into a marriage contract! AND expects her to be an obedient wife!!! Every day I wake up thinking ‘today I will see a comment/blog protesting against such portrayal of men in media’. Disappointment. Disappointment! What is it that keeps men quiet in the face of such portrayals? my feminist brain asks. Is it the lure of seeming ‘powerful’ that makes them immune to such blatantly negative portrayals? Or is it denial? Forgive me, friends, is it arrogance? There has to be some level of accountability to the young people – girls and boys both – who receive messages such as the ones portrayed in both these depictions. Otherwise, we’re effectively saying that it’s OK to have double standards for men and women…and it is OK to kidnap and force a woman into marriage…AND it is OK then to expect her to be the goody-goody, obedient wife. My male feminist friends feel the acute pain and suffering that patriarchy has inflicted on them. More men and women need to reject such images and actively do something about it. 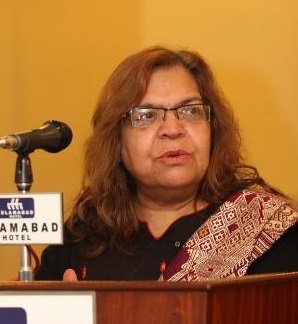 Bilquis Tahira is a feminist activist and has been part of the women's movement and human rights movement in Pakistan since 1988. She is a social development and gender expert; a writer and researcher; and is currently the Executive Director of a national Pakistani women's group, Shirakat - Partnership for Development. She is also the National Coordinator of MenEngage Alliance Pakistan - Shirakat being its Secretariat. Must Appreciated and she is Brilliant women !! !